As of June 15, 2018, due to restrictions by the U.S. Passport Agency, the Clerk of Court's office will no longer process U.S. Passport Books and/or U.S. Passport Cards. If your most recent passport was issued less than 15 years ago and you were over 16 years old at the time of issuance, you may be eligible to use Form DS-82. Please inquire about eligibility when you apply or visit travel.state.gov. 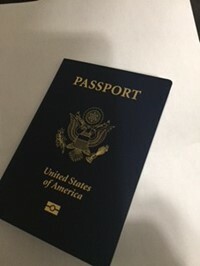 Address any requests for a passport amendment, extension of validity, or the addition of visa pages to a Passport Agency or a U.S. Consulate or Embassy abroad. In advance of your departure, check visa requirements with consular officials of the countries you will be visiting. Total fee for passport book renewal is $110. Passport card fee for renewal is $30. A written statement (made under penalty of perjury) explaining the second parent's unavailability. If you are 16 years of age or older: The passport book processing fee is $110. In addition, a fee of $35 is charged for the execution of the application. Your passport will be valid for 10 years from the date of issue except where limited by the Secretary of State to a shorter period. If you are 15 years of age or younger: The passport processing fee is $80. In addition, a fee of $35 is charged for the execution of the application. Your passport will be valid for 5 years from the date of issue except where limited by the Secretary of State to a shorter period.